The TV ads often pretend that those lobsters you just ate are hauled from the sea by smiling guys on neat and sparkling boats. 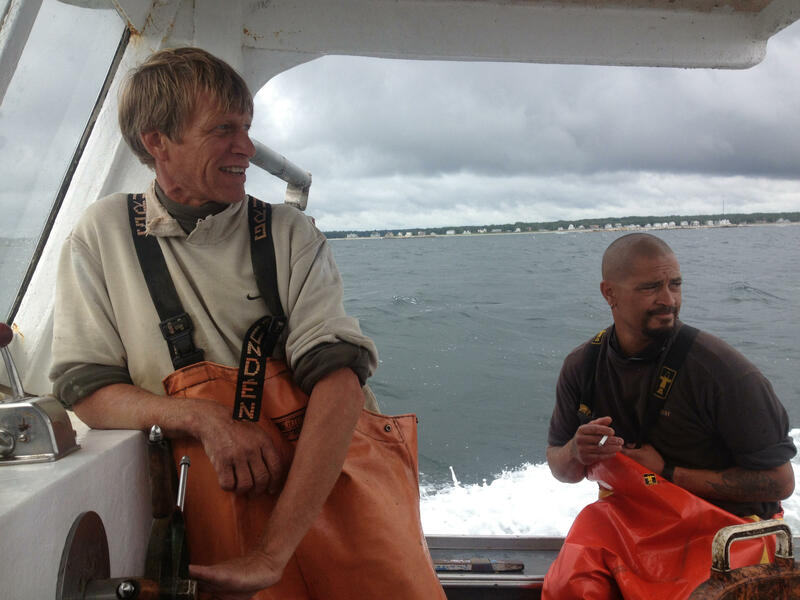 Reality is rather different, as Kalamazoo writer Chris Killian discovered when he visited two lobstermen in Maine. The automated marine forecast channel blurts out its robotic voice in Chip Zeiner’s work garage. It’s 5:30 in the morning and outside it’s still dark, the sky shimmering with liquid stars. Inside the garage, Chip and his first mate Tim Yonuschot try to revive themselves with sips of coffee, drags from their cigarettes, and bites of peanut butter crackers. After a short talk about the day’s weather, the three of us hop in Chip’s old pickup truck and head to the pier at Cape Porpoise, Maine, a sleepy town on the far southern coast. Lobsters are caught around the world but with nowhere near the volume seen along the Maine’s rugged coastline. Last year 128 million pounds of the tasty crustaceans were taken. At the cape, Chip paddles a punt out to his boat, the Helen D, while Tim attaches the day’s bait, a 55-gallon drum of foul smelling fish parts, onto a crane, lowers it onto the boat’s deck. He and I climb aboard and we’re off, the sun just coming up, turning the overcast sky a creamy gray. Creeping out of the harbor, we soon reach open water, Helen D’s four-cylinder diesel engine pushing us through three-foot swells on our way to the lobster grounds known as the Goose Rocks. Chip and Tim strap-on their oilskins. To keep their hands warm in the chill of early morning, they rub them up and down the exhaust pipe that runs up through the open-air cabin. Every lobsterman has his own pots, identified by a specific colored buoy. We’re about a mile offshore and Chip pulls the boat alongside one of his pots and, with a long hook, snatches the rope attached to the buoy, wrapping it around a hydraulic wheel to lift the pot from the ocean floor. Once it’s up, Tim hoists the pot onto the starboard rail, opens the cage, and the two men sort through the lobsters. They snap their tails in protest, claws wide-open and raised, ready to latch on to anything. In one pot, a large female sits like a monstrous, alien looking creature, dwarfing the five other lobsters in the cage. She’s already clawed one almost in half, its white flesh bulging out the sides of a cracked shell. Chip: "You get bit by that and you’re going home." Captain Chip Zeiner at the wheel of the "Helen D"
Lobsters are measured from their eyes to the end of their thorax, sometimes with a special tool but mostly just by sight. Anything over or under the specified size is released. The rest have their claws rubber banded and are tossed into a barrel of seawater. More are let go than taken. Chip says it’s like throwing money overboard but keeping a healthy lobster population ensures a sustainable harvest. Pots are re-baited and sunk to the ocean floor. It happens over and over, hundreds of times every morning. The hours float by, Tim and Chip working more by habit than anything else. The routine is ingrained in both of them. Chip is 51 and began fishing and lobstering almost 40 years ago. Tim, ten years younger, has also been out on the open water for decades. It’s cold out here. The wind picks up and a thin, steady rain pelts us. The open sea is like the desert; there is nothing to stop the wind. The work is hard enough but lobstermen, especially in this part of Maine, don’t get paid as much as you might think. Where you might pay $14.95 for a two-pound lobster, Chip gets about $2 for it. The reason? Middlemen have jacked up the market price but haven’t raised the pay for the men who harvest the creatures. Chip tries to get around it by selling lobsters out of a shack on his front lawn. It makes things a bit easier on the pocketbook but the state of things frustrates both the men. There is no union or representation. Chip talks about one middleman in particular. Another pot comes up, this one full of lobsters with half their shells eaten away in a rusty, odd shaped pattern. Chip says he’s seeing this phenomenon more and more, thinks it’s due to the chemicals that the well-to-do who have homes along the shoreline are spraying on their lawns, pesticides that leach into the ocean and affect the lobster’s growth cycle. By noon the big drum of seawater is about full of lobsters, around 300 pounds or so. We make way for the cape and once there, Chip and Tim load their catch into floating cages with a few dead fish thrown into each one. If the fish weren’t included the lobsters would cannibalize each other, Tim says. Chris: "Wow. Nasty creatures, man." Now settled back onto terra firma, the men grab cold cans of Bud and sip to another day’s work completed. Chip will sell lobsters from the shack for most of the afternoon, talk to tourists, maybe even crack open a few of his lobsters to eat himself. It’s challenging work, he says, but often he doesn’t see it as work at all. It’s a kind of freedom. Visit Chris Killian's blog of his journey across America at Types of America.